The Valveking is brilliant value for money and one of the best entry level valve amps money can buy. Great range of sounds. Unbelievably low price. Texture control adds versatility. A little over-gained for some. Reverb needs taming. Designed in the USA and made in China, the VK112 is awesome value. It was only a matter of time before one of the major players in guitar amplification weighed in with a Chinese-made product and Peavey's ValveKing - launched in 2005 - was at the time much talked about. Combining cool boutique-inspired features with keen pricing, the ValveKings remain an attractive proposition. The range is designed in Meridian, USA, but made offshore in China but the standard of construction is still what we would expect from Peavey. The VK112's cabinet is neatly clad in tough black vinyl with metal corner protectors, and a smart silver check grille-cloth covers the ValveKing's special 12-inch loudspeaker. The electronics are contained within a sturdy open-tray steel chassis on four printed circuit boards - one large PCB holding all the main preamp and power supply components, another for the VK112's pair of 6L6 output valves and 12AX7 driver, with two smaller boards for mains and rear panel connections. These boards aren't through-plated, but they're robust and well-supported on metal standoffs - internal wiring is minimal and neatly routed, while the valve bases are all chassis mounted, which makes replacement easier. At this price it's a good standard of construction that inspires confidence. The ValveKing's front panel is easy to navigate. There's a pair of high and low sensitivity input sockets feeding two channels with separate three-band EQs. Next to the clean channel's single volume control sit a pair of pushbutton switches for toggling the amp's bright function and changing channels, while another pair of buttons next to the overdrive channel's gain control operate preset distortion and volume boost functions that can be used separately or together as required. The front panel tour finishes with a pair of jacks for the series effects loop and a master level control for the short Belton reverb spring. However, the ValveKing's secret weapon is around the back in the shape of a knob Peavey calls the texture control. This is a feature that simultaneously varies the power stage's sensitivity, response and 'break-up' point. With the texture control set fully clockwise, the ValveKing is working in normal push-pull Class A/B operation. Then as you rotate the control anti-clockwise, one half of the output stage is progressively subtracted from the circuit, while the driver valve's gain is increased and its low frequency response altered to complement the change from odd to even-order harmonic emphasis. At fully anti-clockwise, the ValveKing effectively transforms from push-pull class A/B to single-ended Class A, with around 60 per cent less output power and a completely different character. This clever feature can be fine-tuned with a resonance switch that varies low frequency response by altering the amp's damping factor. The rear panel is also home to a handy extension speaker jack and a socket for the footswitch, which changes channels and activates or defeats the boost functions preset on the front panel. Switched on, the ValveKing is quiet and hum-free - always a good sign. The clean channel has a warm, rounded character that's especially friendly to single-coil guitars - we got the best results with all three tone controls set around the halfway mark. The bright switch really works, so if your axe has mid-range-heavy humbuckers you'll approve of the extra twang this feature injects. Push the clean channel's volume control beyond the halfway mark, add a little reverb and you'll get a smooth overdrive that's good for blues or country soloing and easily controlled from the guitar. Back off a little and it cleans up nicely for chords, or push it up for lead breaks. Distortion fiends won't be disappointed with the ValveKing's USA-flavoured overdrive channel. Even without using the boost feature there's a ton of filth on tap, while engaging it will take even the weediest of pickups into almost endless sustain. Some players may even find this channel slightly over-gained. It's still great fun to play unaccompanied with extreme distortion, however, in a live band context there's some loss of definition with the controls maxed out. But apart from a few very expensive exceptions, almost all ultra-high gain valve amps do this and it's one reason why many metal players use solid-state for their overdrive requirements. It doesn't detract from the great sounds that can be pulled from the ValveKing using more realistic control settings. We actually found the best results with the gain level set to around 4. At this low-ish setting the ValveKing is still far from restrained, with plenty of bite and sustain to satisfy for ripping blues or rock solos, while the boost and volume presets add the versatility of a three-channel set-up without any of the complication. You can use the unboosted sound as a powerful crunch channel, then hit the footswitch for extra distortion, volume or both to punch your solos through the mix. The texture control is very powerful and at gig levels it makes a profound difference to the way the ValveKing responds - you can really hear the change in headroom as the knob is turned, along with the shift in character from class A/B bold and punchy to thick and compressed Class A. Combine this with the resonance control and you've got a lot of tone that stays useful from almost bedroom level up to indecently loud - easily enough to cope with small to medium no-PA gigs. The reverb level's range is more than most people will need and, while it tended to get a little splashy at higher settings on both channels, at around one quarter it adds a nice halo to single notes and chords. 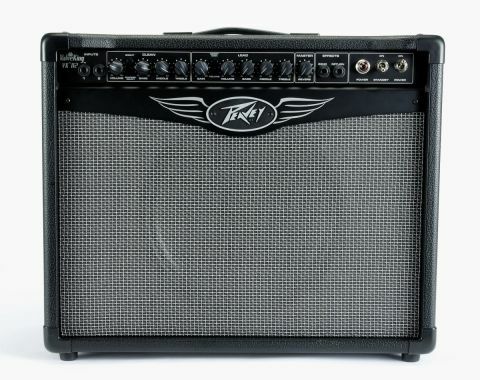 Overall, the ValveKing is a great design from Peavey with some unique features that set it apart from the crowd. Experienced players and pro's won't quickly outgrow it either, and at this price it blows away the competition. Remember, this is an all-valve amp with features you won't find on some models costing twice as much.